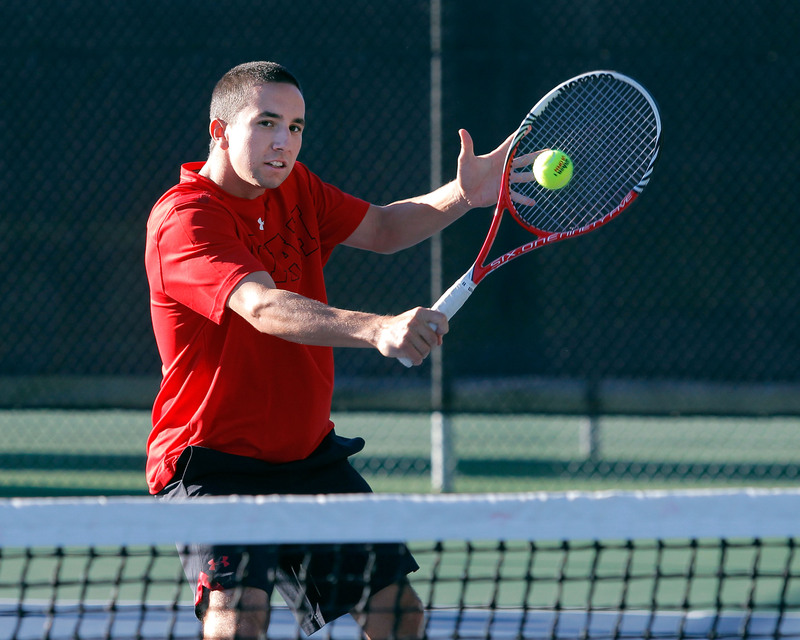 The University of Utah men’s tennis team earned an 8-3 overall record on day two of the 2013 Utah Intercollegiate Tournament. The Utes went 5-1 in singles and 3-2 in doubles play. In the red draw, No. 84 ranked Slim Hamza reached the finals by beating BYU’s Andrey Goryachkov 7-6(8), 6-2. Hamza will play Francis Sargeant (BYU) on Saturday at 10am for the championship. In the semifinal, Sargeant overcame Utah’s Ben Tasevac 7-6(4), 6-3. Tasevac and Goryachkov will square off in a match to decide third and fourth place at 10am on Saturday. Cedric Willems avenged his loss in the first round, by beating Matt Sweet (Utah State) 6-3, 6-3. Willems will play Oliver Good (Weber State) Saturday at 11.30am to determine fifth and sixth place. The black draw final colors all red when Utah’s Devin Lane and Alejandro Medinilla will meet Saturday at 10am. Both seniors reached the finals quite handily, taking care of Juan Canales (BYU) and Caio Poitena (Weber State) in straight sets. Cameron Lee will play Matt Pearce (BYU) to determine fifth and sixth place. That match is scheduled for Saturday at 10.30am. Lee had a bye today. In the white group, Justin Archer earned his first collegiate victory of the year, beating Dylan Harlow (Utah State) 7-6(6), 6-3. Archer and James Smith (Weber State) will play Saturday at 11.30am to determine fifth and sixth place in the white group. In Group A doubles action, Slim Hamza and Devin Lane won two matches to improve to 3-0 to tie for the lead. They will face Sargeant/Goryachkov (BYU) tomorrow at 9am to determine which team will win the doubles title in Group A.
Cedric Willems and Cameron Lee split doubles matches today, improving to 1-2, tying them for third in Group A. The Utes will play BYU’s Galli/Sullivan to fight for third place. Ben Tasevac and Alejandro Medinilla took the lead in Group B, even though they went 1-1 in doubles action today. There currently are three teams sitting at 2-1, but the Utes take the lead by virtue of a better head-to-head record. They will play Pearce/Bourgeois (BYU) for the title in Group B. All doubles matches are scheduled for 9am. All matches are scheduled to be played at Coach Mike’s Tennis Academy, weather permitting. This entry was posted in Schedule/Results and tagged Alejandro Medinilla, Ben Tasevac, Cameron Lee, Cedric Willems, Devin Lane, ITA tennis, Justin Archer, Slim Hamza, Utah Intercollegiate Tournament. Bookmark the permalink.